Gomoa Fetteh is one of the communities in the Gomoa municipality which is the central region of Ghana. Gomoa Fetteh is located on a point overlooking the Atlantic Ocean and the Gulf of Guinea. Fetteh is just about 40km to the West of Accra by the way a crow flies and 65km by road. It takes about 1 and a half hours to reach us depending on traffic in Accra and Kasoa. The whole area around Fetteh has some beautiful beaches and rolling hills with farm land. 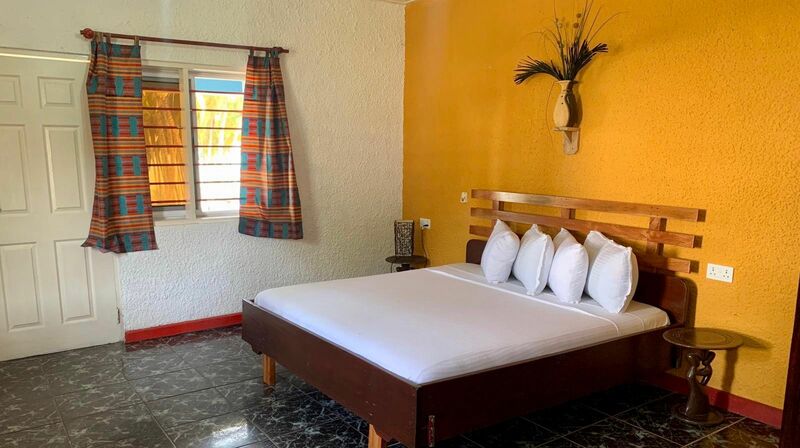 Staying with us is a great way to get out of Accra and also to split up a journey to Cape Coast as we are pretty much 1 and a half hours from Cape Coast also. In Accra get on the N1/Winneba road going west to Cape Coast, you will continue past the Wejia barrier and Kasoa. Beyond Kasoa you will meet a junction town with name Akotsi this is where you will turn off and to the left taking the road with signs for Tills and Senya Breku and Gomoa Fetteh. At the next T junction you will take a right. At the old pink church you will then go left. You will continue through the rolling hills until you will meet a 4 way junction where you will turn left again following the Tills signage. This road will continue without any other major junctions until you reach a fork in the road you will go right here following our surf board signage again. Take this road into the community center and go strait through the 4 way junction at the taxi rank. You will descend the hill until you see our sign once again where you will turn right. Go 100 meters and take a left. Continue strait into our gates about another 200 meters. From where ever you are starting your journey the first step will be getting to Kaneshie station. You can take a cab or a Trotro (public bus) there depending on where you start. From Kaneshie you can get a trotro to Senya Breku which is like the sister town to Gomoa Fete and about 10km further to the west. When you get down from the trotro in the town center you will see a Taxi rank across the junction. You can then go there and ask for a shared cab to Gomoa Fete. When you reach Gomoa Fete and get down you will take the street that goes down the hill towards the coast line. You will walk until you meet another junction where you can take a road going to the right with signage for Tills. You will walk 100 meters and take a left and then the last 200 meters to our gate. Welcome to Tills Beach Resort you made it.